"After watching people for ninety years, you pick up a few things." The early part of the film is heavy on biographical information—Hirschfeld grew up in St. Louis, in a family unusual for its time, for his mother was the breadwinner, and his father stayed at home with the children. (Hirschfeld also claims that his father coined the phrase "senior citizen.") Born in 1903, Hirschfeld grew up being entertained not by television and radio, but by vaudeville and burlesque; as did so many other Americans, between the world wars he went to Paris for an extended stay; he even spent a year in the USSR in the late 1920s. We see here both his aesthetic and political evolution—he dabbled in sculpture and watercolors, and did some overtly political work, before finding the arena that suited him best and for which he is most famous. Stefan Kanfer (formerly of Time) and Adam Gopnik (of The New Yorker) are on hand to provide some cultural context for Hirschfeld's work, in a sort of formalist criticism that seems like a vague effort to get him into the canon. Fortunately, though, most of the rest of the film show many of the artist's drawings, with the subjects of them and Hirschfeld's own reminiscences. His stories have the patter of having been told over and again for decades, so if they're not the most probing, they're certainly entertaining—and his candid and funny discussing his own lack of judgment in picking hits. (He tried to convince Moss Hart to abandon directing a musicalized version of Pygmalion, which he saw as an inevitable hopeless failure.) We get to see, then, the ripening of his mature style, and he hit his stride during glory years for Broadway—these were the times of Marlon Brando as Stanley Kowalski, Lee J. Cobb as Willy Loman, of Guys and Dolls and Oklahoma! and the corpus of shows we think of as legendary. I don't know how successful his style really was with the later years—in some respects, what's suited to Tennessee Williams may be less so to Hair, or Angels in America. But his drawings always retained a keen wit and whimsy, and his influence was significant—among those interviewed here are animators who worked on Disney's Aladdin, and they frankly cop to using Hirschfeld as their principal inspiration. We also see the artist at home, with his wife, an actress, and of course with Nina. 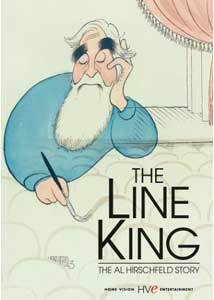 This isn't the most penetrating documentary film portrait, but it's one of the most charming; and given that Hirschfeld died in early 2003, at the ripe old age of 99, it's certainly the best available look at the man and his times. Image Transfer Review: The visuals are a little flat and faded, but Al Hirschfeld's drawings look as crisp as they did when they came off of his drafting table. Audio Transfer Review: It's all clear enough, though the interviews culled from various sources don't always patch together so well, and hiss and ambient noise levels can be wildly variable. Extras Review: The menus feature close-ups of Hirschfeld sketching while Ethel Merman sings There's No Business Like Show Business, very much in keeping with the spirit of the feature. A 2002 short (07m:24s) shows Hirschfeld, at 99, working on what must have been one of his very last caricatures, of Paul Newman, then on Broadway as the Stage Manager in a revival of Our Town. There's also a gallery of 19 of the artist's caricatures, ranging from Aerosmith to Orson Welles; the accompanying booklet features two heartfelt pieces that ran in the Times in January 2003, on the occasion of Hirschfeld's death. Even if the days when Broadway was the center of the world were long before your time, you're likely to be charmed by this film and its subject, whose work and visual style will forever be associated with the salad days of the Great White Way.